In this conversation, Milagros de la Torre and Prof. Shelley Rice (NYU Tisch School of the Arts and the Department of Art History) will talk about the artist’s career in the field of photography and the development of her artistic practice. 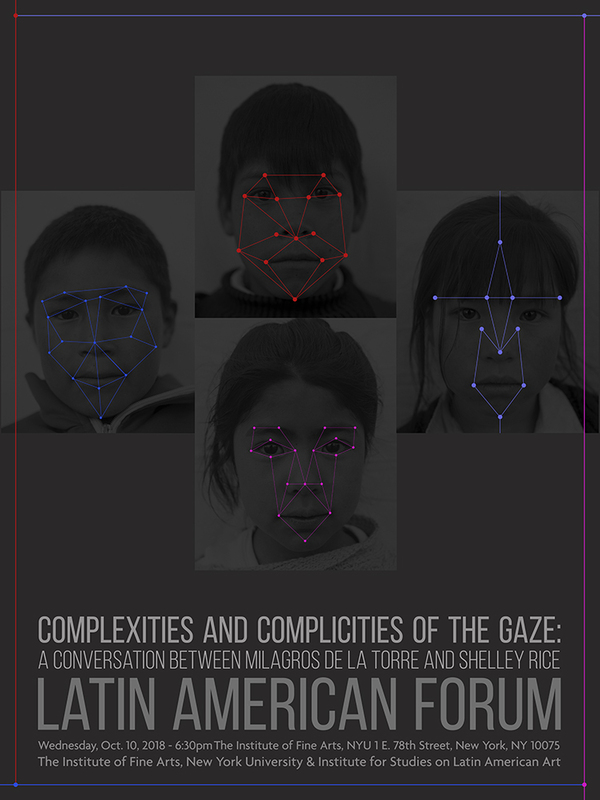 Placing as a central theme the complexities of the gaze, the speakers will explore some of the topics developed in the artist’s work dealing with the construction of memory, and how these processes form individual and collective identities in Peru and other Latin American countries. Milagros de la Torre is a New York-based artist working with the photographic medium since 1991. Her images involve critical research on the history and conceptual procedures of photography. Since her first solo exhibition in 1993 at the Palais de Tokyo (Paris), she has been awarded several fellowships, grants, and prizes. Among them, the Rockefeller Foundation Artist Grant, the Romeo Martinez Photography Prize, and the Young Ibero-American Creators Prize for her series The Lost Steps (1998). Besides, she received the Guggenheim Fellowship (2011), The Dora Maar Fellowship from The Brown Foundation (2014), The Peter S. Reed Foundation Award in Photography and was the recipient of the Merited Person of Culture Award given by the Ministry of Culture, Peru (2016). In the year 2012, Prof. Edward J. Sullivan curated ‘Observed’, her first retrospective exhibition, presented in the Museo de Arte de Lima (MALI), and the Americas Society in New York. Shelley Rice is Professor at Tisch School of the Arts and the Department of Art History, College of Arts & Sciences, in New York University. Critic and historian, Shelley Rice has lectured on photography and multi-media art in the USA, Europe, South America, Asia, Australia, and Africa. She has published many books and is also a photography and art critic with numerous essays published in several journals as Art in America, Art Journal, Études Photographiques, among others; her regular columns have appeared in The Village Voice (1976-77), Soho Weekly News (1978-79) and Artforum (1980-82). Currently, she works for the online magazine of the Jeu de Paume Museum in Paris, where she served as the Invited Blogger in 2012 and where she has been, since 2014, host of the radiophonic talk show The Meeting Point.